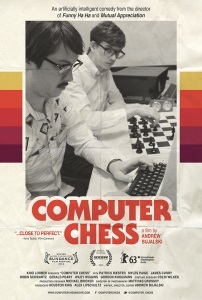 Set over the course of a weekend tournament for chess software programmers thirty-some years ago, COMPUTER CHESS transports viewers to a nostalgic moment when the contest between technology and the human spirit seemed a little more up for grabs. We get to know the eccentric geniuses possessed with the vision to teach a metal box to defeat man, literally, at his own game, laying the groundwork for artificial intelligence as we know it and will come to know it in the future. This film bears an 87%/53% critics/audience rating on rottentomatoes.com, and is currently streaming with Amazon Prime. It's kind of like a Christopher Guest fan tribute film, sprinkled with surrealism. I think it is the only movie I had to watch twice because things really take a weird turn in the end and I had the impression the movie was hinting everything was a simulation. It also took me the second viewing to catch Mitch. Mitch? I did not catch Mitch... I missed Mitch. Dang, I meant to watch this when it first came out on video, but forgot all about it. So, thanks for the post. I'll check it out this weekend.